The course’s six-day race meeting, which boasted purses as high as $2,000—rivaling those of other top national tracks—ushered in a new era for the Southern turf. 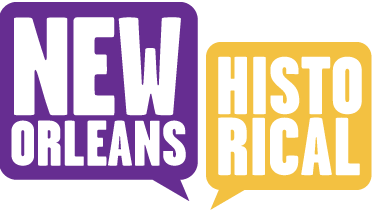 Closing out the week of racing was the New Orleans Plate, a two-miler won by Antelope, a mare entered by Colonel Adam L. Bingaman of Mississippi. 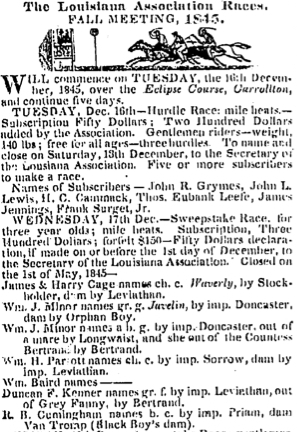 The New Orleans Daily Picayune remarked in its final race report, “the day will come when the Eclipse Course will be the first in the United States.” Only one year later, in April 1838, the Spirit of the Times would declare it as such, stating, “The Eclipse is the ne plus ultra of courses,”—the ultimate of race tracks. Yet the rule was quickly broken. 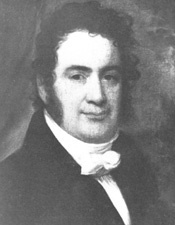 The next spring meeting of 1845 hosted the two-mile Carrollton Purse on Sunday, April 13; this race for $200 was won by the four-year-old colt Croton, entered by John R. Grymes, the city’s District Attorney. Later that year, however, the Club’s five-day December meeting was held at the Eclipse only from Tuesday through Saturday. If a Sabbath ban had been in effect, again it was short-lived, for the Club ended its six-day race week in April 1846 on a Sunday—holding two races that garnered larger attendance than any other day during the spring meeting. Thoroughbred racing over the Eclipse Course continued for three more years until its last meeting of April 1849; six days of races closed with the Carrollton Purse for $250, best three-in-five of one-mile heats, with the five-year-old entry Ӕolus beating two fillies—on a Sunday. 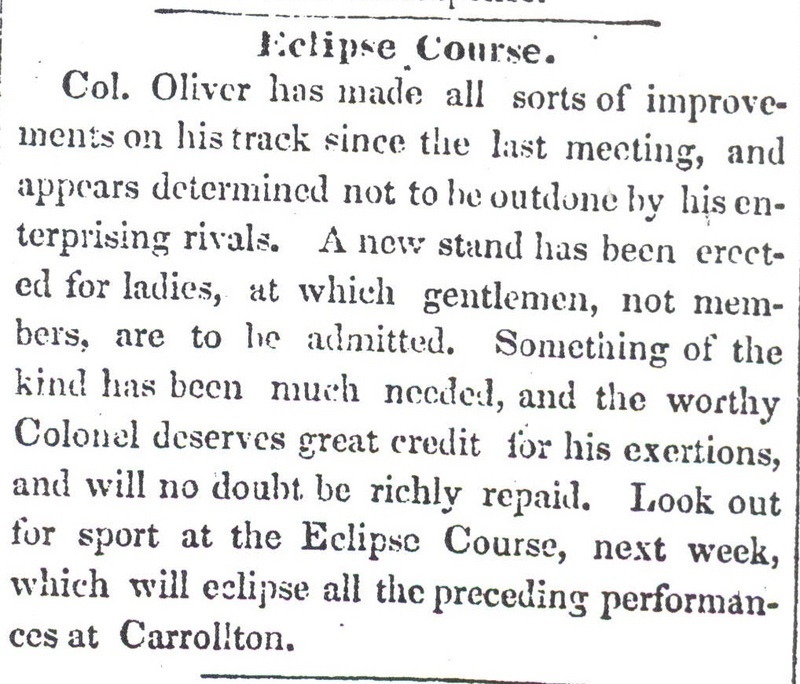 Annie Johnson, “Eclipse Course, Carrollton: Pioneer of Thoroughbred Racing on Sundays,” New Orleans Historical, accessed April 19, 2019, https://neworleanshistorical.org/items/show/472.